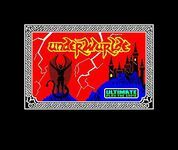 Underwurlde is a video game for the ZX Spectrum and Commodore 64 developed and released by Ultimate Play The Game in 1984. The game is the second in the Sabreman series, following on from his adventures in Sabre Wulf. The format of the game is a 2D side view flip-screen platform game. The aim is to escape from the Underwurlde via one of the three exits, to go to either Knight Lore, Pentagram or Mire Mare.